The General Dental Council, the organisation that regulates dental professionals in the UK, has decided that tooth whitening is a form of dentistry. This means that you should ONLY have your teeth whitened by a dentist. 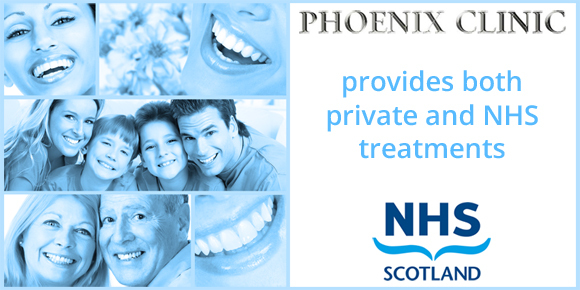 At Phoenix Clinic, following a check up by our dentist, impressions of your teeth will be taken. Your Custom made trays will be made at our Laboratory and will be ready within a few working days. Your trays are to be re-used time and time again, with only the need to buy solution from us. You will receive solution with your initial treatment. A veneer is a new front surface for a tooth, custom made from ceramic or porcelain. Veneers can be used in a variety of situations. For example to align crowded or crooked teeth, close gaps or lighten tooth colour. Where a tooth is missing it can be replaced by attaching a false tooth into the gap. Unlike traditional plates or dentures bridges are designed to stay in place and not be removed by the patient. Dental bridges are held in place by using the tooth or teeth on either side of the gap as an anchor for the false tooth. A dental crown or a tooth crown is a tooth shaped material usually made of porcelain, metal or a combination of both and placed on the tooth. Dental crowns are often referred to as dental caps. This is because a dental crown is a type of a dental restoration that covers a part or the entire tooth. A dental crown helps to strengthen the tooth, improve its appearance and gives it a natural shape.